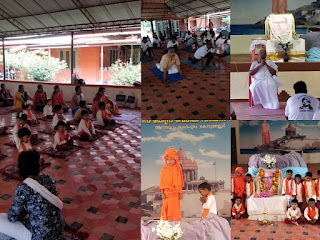 On 18th November both elderly QCI students and Samskarvarga children paid their homage to Ma. Eknathji by pushparchana. Jeevanvrathis, Su. Nilakshididi from Odisha Prant and Sri Srinivasji from Andhra and Telengana Prant were present on the occasion. Sri Sudhakarji spoke to the members about the nature of the ‘ leader’in Ma. Enathji. On 19th November which is regarded as Sadhana Divas, our Yoga satra and Yoga varga participants celebrated Ma Eknathji’s 104 th birthday by offering floral tributes in front of his portrait, after their regular practice of yoga in the early morning and after a short talk by Didi. Ma. Lakshmi Didi while talking to them explained the efforts taken by Eknathji in building the Rock Memorial and Vivekananda Kendra, with the spiritually oriented service mission. Knowing the importance of yoga in one's day today life, he made arrangements for getting trained all the jeevanvrathis way back in 70s. She encouraged all to hold on to this kamadhenu, the maha mantra’ jeevane yavadadanam syat pradanam tatodhikam’ and make their lives purposeful and joyful. Ma Eknathji’s Birthday was also celebrated on the same day by Sandeepani Sishuvihar too. The parents, tailoring unit students, yoga varga members assembled at Dakshina hall of Ananda Dham to celebrate the event. All Children were well prepared to play their own role. 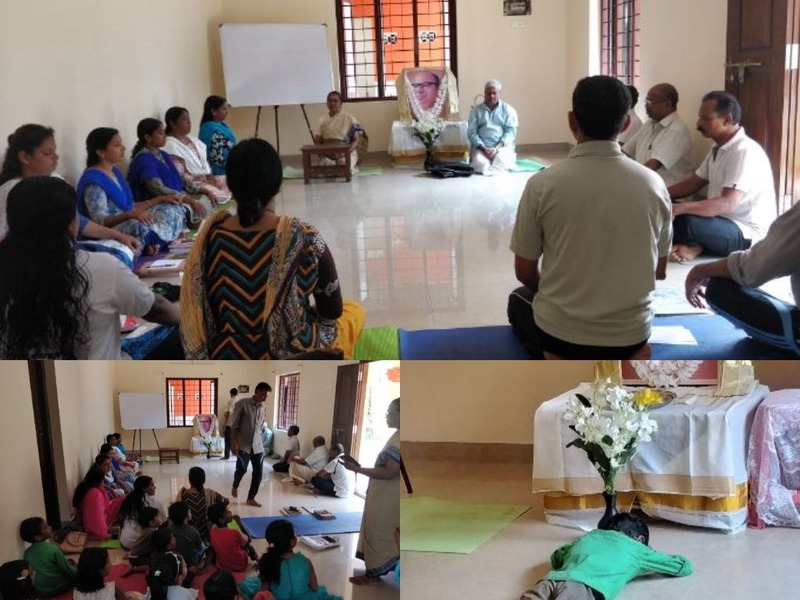 Bindu teacher, inmate of Anandadham, welcomed all the above for the function. The programme started with the prayers by all in unison. Master Arav and Agneya set the tone of the function with their brilliant performance former dressed as Ma. Eknathji and the latter as Swamiji. 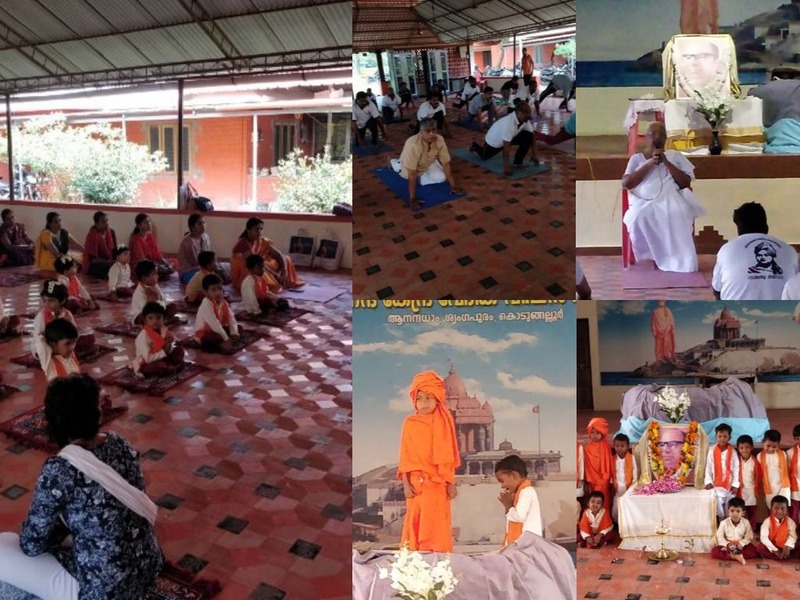 All the children were dressed as Ma.Eknathji, supported them with their part, reciting from memory, short paragraphs from the Sadhana Oru Tapas (Sadhana of Service –Malayalam version). Ma Lakshmi Didi in her talk explained how Ekanathji made an impossible task possible and built the Memorial in short span of time an encouraged all who were present visit Kanyakumari to have firsthand experience. The programme concluded with paying floral tributes to Ma. Eknathji and chanting of Shanti Mantra.